With the spring comes new anime—50 of them to be exact. But with so much anime, how do you know which ones to watch? Check out the trailers and brief blurbs below to see which of them catches your interest. What It’s About in One Sentence: The second season of an anime about a working wife married to an otaku. Marriage is hard. It&apos;s even harder when one of you is an otaku and the other is not. What It’s About in One Sentence: The second season of an anime about an incredibly pessimistic high schooler and the club he is forced to join. What It’s About in One Sentence: The story of a girl who can see ghosts and her subsequent supernatural adventures with her friends. What It’s About in One Sentence: The newest anime in the Mahou Shoujo Lyrical Nanoha series—this time about a group of girls in a magical academy participating in a combat tournament for young mages. What It’s About in One Sentence: A young adventurer searching for love in a dungeon and a goddess seeking more followers team up to achieve their goals. What It’s About in One Sentence: Based upon the world of The Disappearance of Haruhi Suzumiya, this spin-off follows the literature club in this parallel universe. What It’s About in One Sentence: In this short-form anime, Holmes is hired by the police department to hunt vampires in London. What It’s About in One Sentence: This anime follows a young man in an elite culinary school where only 10% of the students make it to graduation. What It’s About in One Sentence: The seventh Jewelpet anime—this time following a group of Jewelpets who transform into human girls. What It’s About in One Sentence: The second season of an anime about an elementary school girl who grasps her chance to become an idol and enters a world of fashion, dance, and music. What It’s About in One Sentence: This is the story of a high school girl who can see spirits (though she’d rather not) and the boy in her class whose job it is to usher spirits to the other side for reincarnation. What It’s About in One Sentence: This anime follows an otaku who becomes a high school physics teacher. What It’s About in One Sentence: After a virus wipes out all of mankind over the age of thirteen, vampires enslave the remaining children to use as livestock. What It’s About in One Sentence: This is the third season of Highschool DxD, the story of a human boy who enters a formerly all-girls school filled with angels and devils. What It’s About in One Sentence: Based on the Square Enix arcade game of the same name, when two parallel worlds begin being merged into one, each sends a group of “gunslingers” back in time to prevent the opposing parallel universe from ever being created. What It’s About in One Sentence: Continuing the story of Fate/Stay Night: Unlimited Blade Works, this anime focuses on a war where mages and legendary heroes team up to fight for the holy grail. What It’s About in One Sentence: In the near future, when humanity’s android servants are online for too long, things start to go bad—luckily the corporation that makes them has a department set up to deal with these androids. What It’s About in One Sentence: This is the third season of an anime based on a dating sim where a group of young men are in a school training to be idols. What It’s About in One Sentence: The third season of the Tesagure! Bukatsu-mono anime which follows the hijinks of an odd all-girl "groping club". What It’s About in One Sentence: Years ago a tear in the fabric of reality opened in the sky, trapping both humans and creatures from another world in New York City—but now as one group seeks to bring down the barrier, another group tries to stop them. What It’s About in One Sentence: The eleventh season of an anime about kids who save the world with card games. What It’s About in One Sentence: This is the story of a prince trying to reclaim his fallen kingdom. What It’s About in One Sentence: The second season of an anime about a high school honor student who becomes frustrated with his life and decides to join the tennis team. What It’s About in One Sentence: A cat girl, a bunny girl, a sheep girl, and a dog girl start a band together. What It’s About in One Sentence: This short-form anime focuses on a young man working in a cafe—and his encounters with a man who once called him ugly. What It’s About in One Sentence: This is a TV re-edit ofGhost in the Shell: Arise, though the final two episodes will be entirely new content. What It’s About in One Sentence: The second season of an anime about the adventures of a Japanese school girl and her friend from Great Britain. What It’s About in One Sentence: This is the second season of an anime about an ace pitcher who joins a high school baseball team and strives for the national championship. What It’s About in One Sentence: The second season of this anime continues to follow a thief who can steal anything in the world—almost like magic. What It’s About in One Sentence: This is the second season of a short-form anime that tells the tales of a group of zits living on someone’s face. What It’s About in One Sentence: This is the fourth season of a short-form anime about the crazy lives of a high school girls tennis club. What It’s About in One Sentence: This short-form anime is a spin-off of Teekyu and follows titular airhead and tennis-club member, Nasuno Takamiya. What It’s About in One Sentence: A high school freshman becomes a club president at a school where club presidents fight using superpowers. What It’s About in One Sentence: Once upon a time, this high school band was one of the best in Japan—but while those glory days have long since passed, the band once again has a chance of making it big. What It’s About in One Sentence: Set in a world where aliens invaded during the Edo period, this anime follows an eccentric samurai who does odd jobs for a living. What It’s About in One Sentence: These buxom nurses fight illnesses of the body during the day while taking out the “cancer of society” at night. What It’s About in One Sentence: This is the story of a physically huge high school freshman with a scary face who one day saves a girl from a molester on a train. What It’s About in One Sentence: One day, a young girl discovers her best friend is actually a magical girl working to send an alien creature home. What It’s About in One Sentence: This is the story of the (not very intelligent) cat of Chinese astrology and her quest to be added to the Chinese Zodiac. What It’s About in One Sentence: This anime follows a spirit who has been separated from his body. What It’s About in One Sentence: Made to promote Urawa-ku in Saitama Prefecture, this short-form anime follows the lives of eight school girls. What It’s About in One Sentence: The second season of an anime following the son of a Yakuza crime boss who finds himself engaged to a rival gang leader’s daughter (that he hates but must pretend to like to keep peace between the gangs). What It’s About in One Sentence: Set after the destruction of Earth, humanity continues to flee from their alien enemy on colony ships created from fragments of the planet in the second season of this anime. What It’s About in One Sentence: The second season of an anime based on a collectible card game about children who battle by using cards to summon monsters. What It’s About in One Sentence:This, the latest addition to the Saint Seiya series (Knights of the Zodiac in the West), continues the adventures of a group of warriors with magical armor who fight to protect the reincarnation of the goddess Athena from the other Olympian gods. What It’s About in One Sentence: Based on the book of the same name, this anime follows a British family as they dine across Japan. What It’s About in One Sentence: This is the second season of an anime about an all-girls academy, which is more prison than school, and its first male student. What It’s About in One Sentence: A high school delinquent discovers that by kissing certain girls, he can activate their magical powers. What It’s About in One Sentence: After his wife and child are killed in a ninja gang war, a normal Japanese office worker finds his body possessed by a mysterious ninja soul–and together they seek to kill evil ninja. 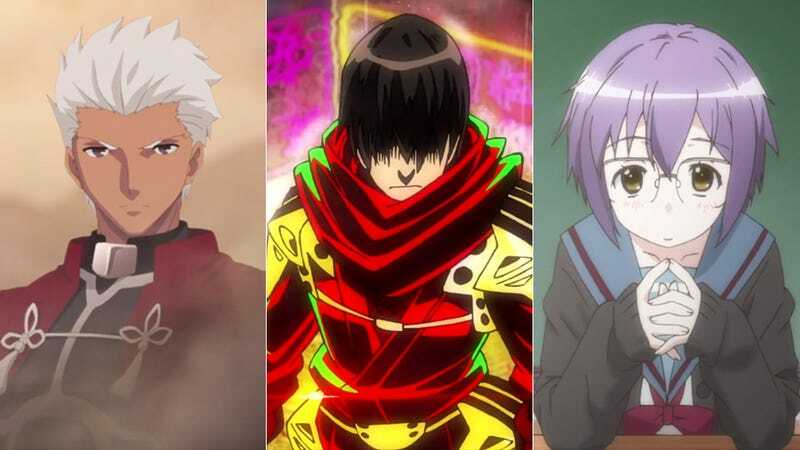 For more anime recommendations, check out our picks for the best anime of 2014.